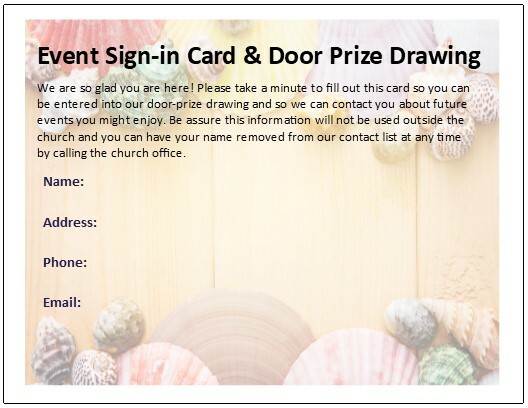 These cards are a great way to get information from summer guests so you can invite them back to activities year round! Many of your churches are holding community outreach events in the summer. You have a great expectations for them, but often you don't see much church growth after them because you don't work to intentionally connect with the guests who come. 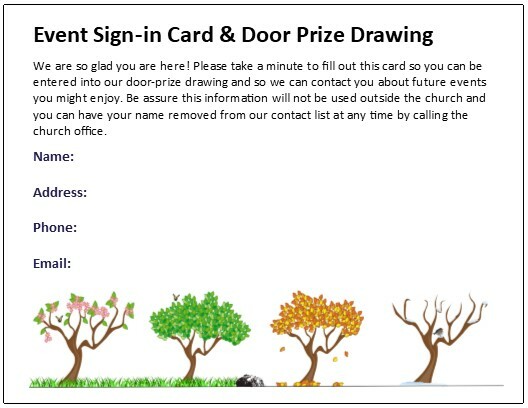 This is VERY EASY to do if you offer a great door prize and have people sign up for it. 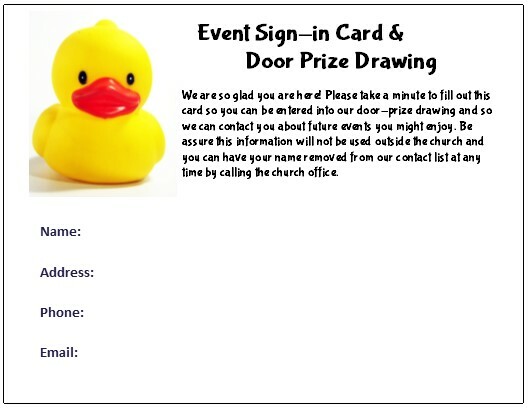 Below is a set of combined connection and door-prize drawing cards you can download, run off and use. In the download is a set of Free MS Publisher Templates, ready-to-print PDFs, and images. This is a wonderful summer recipe you can print up and give you to church guests. 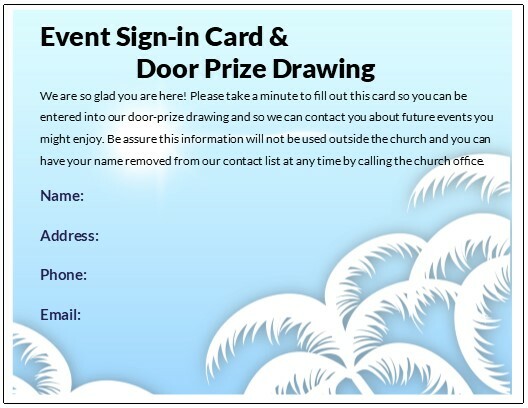 Put information on the back as a reminder of and invitation to your church. Everybody loves recipes, especially if they are good ones! This one is fantastic! It is for a BBQ Beef Brisket that will literally melt in your mouth. It comes from a wonderful Texas cook I knew in the past who has now gone home to be with the Lord. But before she left she passed on a number of incredible recipes. 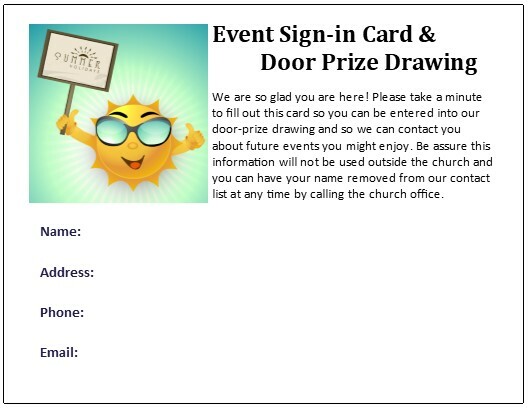 You can print up this card as a gift to connect with visitors at who summer events at your church. 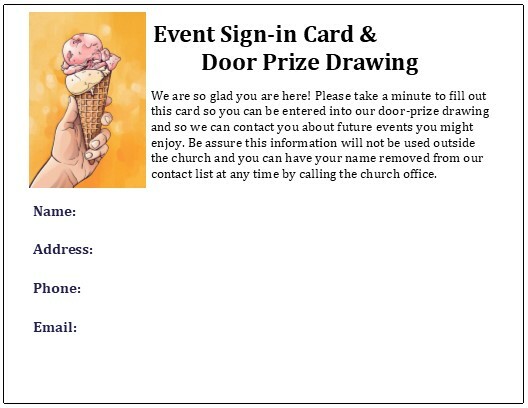 On the back of it you can add church information, time, programs etc. and invite people back to visit you anytime. You never know when someone might decide to come back to a church and if they have a yummy recipe card to remind them, food for the tummy may become food for the soul. Having great food isn't enough, you need to intentionally connect with your summer guests. With the best of intentions, churches plan community outreach events in the summer: free food and fun festivals of all kinds, free movies, and events that are tied to local summer traditions. Though they often get a large attendance and everyone has fun, we need to ask ourselves, how can they do more for the kingdom of God? Being community friendly and providing free events isn't enough if we want to use them to grow our church and ultimately to help people come to know Jesus as Savior. Sometimes we need to remind ourselves why we do all the work we are doing. It's easy to fall into the habit of thinking that just doing good things will help people think kindly about our church and Jesus, but we live in a secularized world, where it takes much more than attending a free BBQ to change the eternal destiny of a soul.